Tuna is a meaty fish with a distinctly rich, strong flavour and is a good source of omega-3 fatty acids and protein. Due to its popularity, tuna is being dangerously overfished in some parts of the world – depending on the type of tuna and where it is fished, it may even be on the endangered species list. Always check the latest sustainability information before buying tuna or choose sources that have been given the MSC (Marine Stewardship Council) seal of approval. When buying fresh tuna, it is important to judge the freshness before purchasing as tuna is often served raw and it goes off quickly. The best way to check the freshness is by the smell and touch – it should be odourless, firm and moist. Tuna is graded depending on the fat content, quality and size of the fish. The colouring of tuna ranges from deep red steaks with a lower fat content, mostly used for grilling, to the very pale pink belly which is the fattiest cut highly prized by sushi chefs for its texture and flavour. When buying tuna steaks for cooking, ideally choose thick cuts (about 3–4cm) to ensure that the tuna remains moist. Tuna is cleaned, skinned and cut into loins or steaks before it reaches the fishmonger so it only needs a minimal amount of preparation before cooking. Tuna is suited to pan-frying, chargrilling or barbecuing and should ideally be quickly seared and served pink in the middle. In the same way you shouldn’t cook lean meat, such as venison, to more than medium-rare, the same is true of tuna. Marinating is a great way to pack in flavour before cooking the fish. If good quality and very fresh, tuna can be cooked very lightly or not at all and served as ceviche, carpaccio, sushi or sashimi. 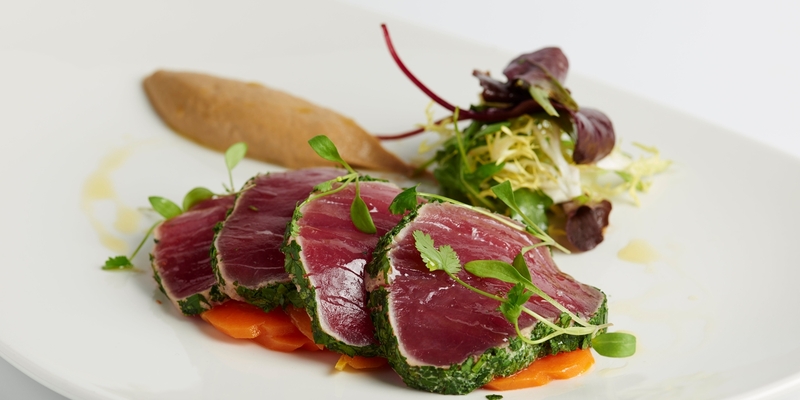 Tuna is a versatile fish when it comes to flavour combinations and each cuisine has its favoured flavour partners. Tuna carries spice and heat well so don’t be scared to use bold flavours. While we all know Salade Niçoise, which by the way is infinitely better made with fresh tuna, lesser known is the Italian dish, Vitello tonnato, a dish of veal and tuna. Shaun Rankin serves tuna with a heady Bloody Mary jelly and a cooling avocado purée. Also, try scattering a few coriander leaves over a seared tuna loin or serve with a side of mushrooms to bring out the flavours. Orange, chilli, fennel and capers all offer sharpness to counter the lean, muscular taste of its flesh.